Healthy bare root. Received 4. Will await success with rooting since I understand these don’t like to be moved and are difficult to get started. It grows along my arbor just as I intended, thanks! Trailing Arbutus also known as Mayflower is a common evergreen vine. This plant can be identified as Mayflower to many. This plant grows along the ground as a covering plant. 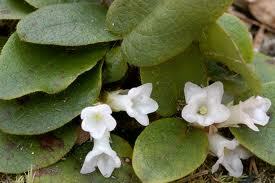 Trailing Arbutus is the floral symbol of Nova Scotia. This plant can be found growing along the northern portions of the East Coast. The Blooms it creates are small and trumpet-shaped, often pink that fades into white. These blooms are slightly fragrant. When the Blooms can be done the plant, produces small raspberry-like fruits. Trailing Arbutus grows best in humus soils that can be acidic. Also, know as the Mayflower plant, is believed by some to be the first plant that was seen by pilgrims during their early spring in America. Many scientists think it may have even been around since the last glacial age. May Flower- Trailing Arbutus trailing plant has fuzzy stems, and white or light pink blooms emit a sweet fragrance. Unique in this method, it grows and maintains its nourishment from a particular fungus that feeds the plants roots. Despite its best efforts, the trailing arbutus is very difficult to relocate. May Flower- Trailing Arbutus seeds that are carried off by ants very rarely yield any fruit. The rarity of these beautiful plants is only increasing due to the constant destruction of its native environment and its difficulty in transplantation. Trailing arbutus that may grow in the wild should be left alone and, in fact, may be protected by law depending on the state. If the wild plant grows out of its natural habitat, it may very well be the last one that is ever found in the area. Fortunately, many native plant nurseries have tried to continue the survival of the plant by propagating more. Soil should be moist and acidic. It can grow where many other plants have failed. When planting, the root ball should plant so that the top is only about one inch below the surface. Water thoroughly after planting to ensure that the roots receive enough water. Natural mulch can be added lightly around the plant. Once it grows, it needs little maintaining and care except regular watering and the addition of mulch as needed.